The Kissimmee River in southern Florida, USA, is cur rently undergoing a major long term, large scale restoration process to reverse channelization that occurred more than 40 years prior. The river flows south from Lake Kissimmee to Lake Okeechobee, draining approximately 6200 km . 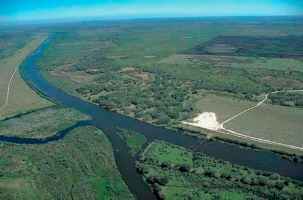 Between 1962 and 1971, the river was straightened by dredging a channel through the Kissimmee River valley to prevent flooding in the developing watershed. Two thirds of the historical floodplain wetlands were drained. A series of water control structures were created which regulated the flow of the river and created five sequential pools encompassing the entire length of the river. This enormous undertaking changed a 166 km river with a 3-5 km wide floodplain into a 90 km long, 100 m wide, and 9 m deep channel (Figure 3). This channel became known as the C38 canal and was considered an engineering marvel and success. Flooding was greatly reduced and new land was made available for development. Not long after the completion of C38 however, the effect of this project on the river and adjacent wetland ecosystems became apparent. Numerous restoration studies were undertaken during the next 20 years. Figure 3 Aerial view of the channelized Kissimmee River, FL, USA. Photo courtesy of Pat Lynch, SFWMD. destroyed 12 000-14 000 ha of adjacent wetlands. These physical alterations had unintentional cascading effects on the biological and chemical component of the ecosystem. Wintering waterfowl, wading bird, and game fish popula tions declined. Certain beneficial ecosystem functions such as nutrient retention from water draining into Lake Okeechobee (which was already experiencing elevated phosphorus loading) declined as well. In 1976 the Florida legislature enacted the Kissimmee River Restoration Act that proposed a restoration of 69 km of river channel and 11 000 hectares of riparian wetlands, allocating approximately $500 million for the project (eight times the cost of the initial channelization project). The complete restoration plan is projected to take more than 15 years to complete. Restoration will consist of raising water levels to inundate the riparian wetlands through the existing water control structures in the upper basin, backfiling the canal, and creating new river channels in the lower basin. The goal of this restora tion project is to return a significant portion of the Kissimmee River to its historic riverbed and floodplain and re establish an ecosystem that will support the fauna and flora that existed prior to the creation of the C38 canal. 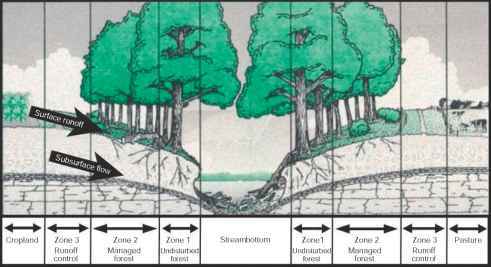 The premise is that the re establishment of natural water levels and flow will provide the habitat template and driving force for the restoration of ecological integrity. A demonstration project was conducted in the 1980s to assess if restoring a natural flow regime to the historic river channel would improve ecosystem integrity, and if it was even feasible to keep the newly deposited channel sediment from washing downstream. This study involved inserted weirs into a section of C38. As expected, the weirs increased flow into the floodplain and historic channel, causing an increased transport of organic matter from the floodplain into the river channel, and also re established more natural sand substrata in the river channel. Sediment loss issues were addressed through hydraulic modeling simulations. Due to the magnitude of this restoration effort, feasi bility studies were performed to assess the ecological impact of the restoration process itself. In 1994 a small (330 m) test area of the canal was backfilled and river water quality (turbidity, dissolved oxygen, mercury, and nutrients) was monitored for detrimental effects of the restoration process. No lasting effects of the effort were found. From 1999 to 2001, phase I of a four phase project was completed. Twelve kilometers of the middle 'pool' of C38 were backfilled using 9.2 million cubic meters of Earth that was excavated during the original canal project. Two new river sections (2.4 km total length) were created to connect the original Kissimmee River channel, because portions of the historic channel were filled with spoil, or dredged through during the creation of C38. In addition, one of the water control structures was removed. This phase re established flow through 24 km of the river. During this restoration process, river water quality was monitored for phosphorus, turbidity, and dissolved oxygen concentrations, and again no lasting detrimental effects on water quality were observed. It is unlikely that the entire river channel will be restored due to increased development in the basin since the C38 canal was created. Additional projects in the northern basin are underway to control both the flow of water and nutrient load down through the restored Kissimmee River valley. This ecologically based project aims to restore both the structural and functional integrity of this river system. An ecological evaluation program has also been created to track the restoration of the river and the floodplain wet lands. This program will follow physical, chemical, and biological components, and will allow for adaptive man agement opportunities to adjust the restoration process as needed to maximize the recovery of ecological integrity. Some of the variables that will be tracked include wading bird population numbers (biological), area of wetlands (physical), and miles of river with improved dissolved oxygen concentrations (chemical).